It’s pretty amazing, for some small thing you barely remember doing decades ago to pop up and serve a greater purpose than you could have ever predicted. In 1989, I lived in Cincinnati, Ohio, where for several years I’d been working as a music promoter. I kept odd hours (still do, actually) and scraped by, booking touring and home-grown underground rock acts in a series of small, dive-y bars. One of these was a joint in the University area called Murphy’s Pub. It had a back room with a legal capacity of 75 and a tiny stage where bands could play. Back then, in the days long before e-mail lists or Facebook events, if you were a DIY promoter you got the word out about gigs by throwing together the master design for a flier by hand—literally cut and paste—which you’d run off Xerox copies of at the local Kinko’s. Then you’d take these crude-looking fliers (on colored paper, if you had the budget for it that week), and walk the streets, stapling them to telephone poles and taping them up in the widows of record stores. If you were lucky, maybe enough people who’d heard the featured band on the late-night, left-of-the-dial community or college radio station and/or read about them in a fanzine, knew someone who had taped their record from somebody else, or had friends in the opening band would come to the show and pay the $3 (sometimes without trying to talk you down to $1 or $2 so they could also buy a beer). As long as that happened, you could make the band’s guarantee or, if they were playing for a percentage of the door (which was often how I worked the deals, since neither my partner nor I had anything resembling a cash reserve if the take fell short), at least they would get a decent cut. If you were really lucky, maybe there’d be a little left over after paying the bands and the soundman to cover the cost of the fliers and put toward your long-distance bill or even a grilled cheese and fries at a diner after the show. Being repaid for the time you actually put into making the whole night happen or the cash you lost on the nights where not enough people came out? That wasn’t even a consideration. You just wanted to see the bands yourself, even if no one else did. When you were 24 or 25 years old, that was enough. One of the many bands I brought into that shoebox-sized room at Murphy’s that year was a rising Seattle trio called Nirvana. They were touring on their debut album, Bleach, which was then mainly known via word of mouth and by the handful of tuned-in folks who followed the impeccable output of the label they were on, Sub Pop. The show took place on October 6 and the space wasn’t even half full—about 30 people—but Nirvana was awesome. Wall-shakingly loud, super-raw, passionate performers. I brought them back to the next club I booked at the following year; after that, Dave Grohl joined the band, they made Nevermind, and the rest you probably know. So imagine my surprise when, 30 years later, Cincinnati design/print shop We Have Become Vikings tracked me down and asked if I’d be cool with them reproducing my crudely cobbled together flier for that first local Nirvana show on T-shirts and hoodies, with a portion of the proceeds from the sale of each sold going to domestic violence prevention/assistance organization Women Helping Women. What? My little scissors-and-glue stick creation from the copy shop self-serve can help improve women’s lives? Of course, I immediately said yes. Knowing that Kurt Cobain was an outspoken supporter of the same cause, I’m sure he’d have been all for it too. 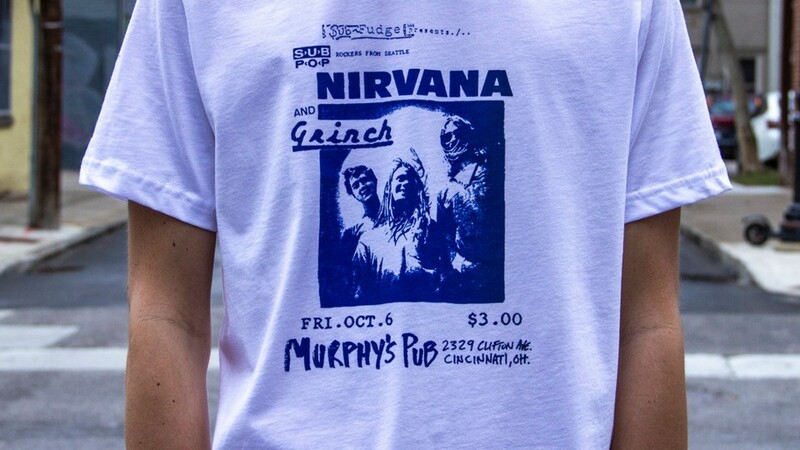 Nirvana Murphy’s Pub 1989 T-shirts and hoodies are available from We Have Become Vikings. $5 from each item sold will be donated to Women Helping Women. For more information, visit https://wehavebecomevikings.com/shop/?category=Nirvana.